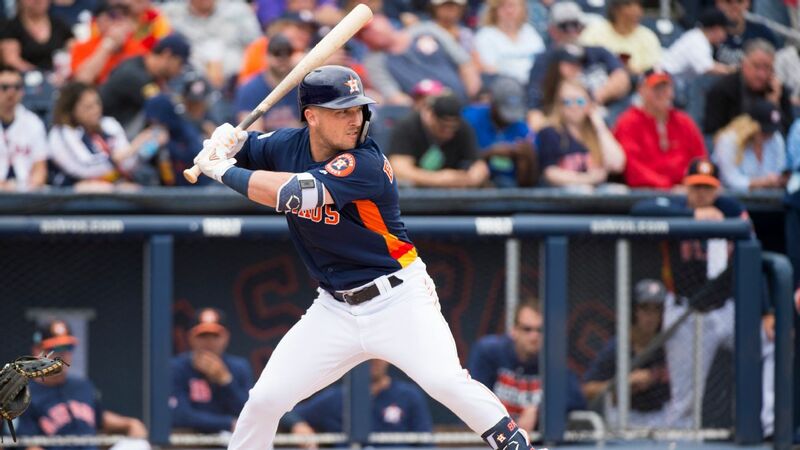 WEST PALM BEACH, Fla. --Alex Bregman's decision to sign a long-term contract with the Houston Astros was not impacted by the second slow free-agent market. Selected by Houston with the second overall pick in the 2015 amateur draft, Bregman made his debut with the Astros in July 2016 and helped Houston win its first World Series title in 2017. His contract was renewed this month by the Astros for a major league salary of $640,500 this year. The new deal includes a $10 million signing bonus, half payable within 30 days of the agreement's approval by the commissioner's office and the rest within 90 days' of approval. Bregman gets salaries of $11 million annually from 2020-22 and $28.5 million in both 2023 and 24. His salaries in the final two years can increase based on MVP finish earlier in the deal. They would go up by $1.5 million for first place, $750,000 for second and $500,000 for third, and by $2 million if he wins 2020 and '21. If he wins MVP in '21 or '22 and again in '23, his 2024 salary would rise by $2 million. He also gets the ability in 2023 and '24 to designate 10 teams he cannot be traded to without his consent. "We thought he had chance to get to the big leagues pretty quickly and we thought he had a chance to be a pretty special big league player -- and we were right,'' Houston general manager Jeff Luhnow said. Bregman first approached Luhnow about a long-term deal after last season. His agent, Brodie Scoffield, met with Astros representatives at the general managers' meetings and the winter meetings, then gained pace during spring training. He would have been eligible for salary arbitration next winter after for free agency after the 2022 season. An All-Star in 2018 when he led the league with 51 doubles, the 24-year-old Bregman has displayed a penchant for the big hit. Luhnow said he called Bregman's tying home run off Boston's Chris Sale in the eighth inning of the 2017 AL Division Series Game 4 finale and his game-ending 10th-inning single against the Los Angeles Dodgers' Kenley Jansen in Game 5 of that year's World Series. "Two moments that are, in my mind, some of the top moments in my baseball life and Astros baseball franchise history,'' Luhnow said. Bregman hit his third homer of the spring in the sixth inning of a game Friday night against the New York Mets. NOTES: Manager A.J. Hinch confirmed Friday that Brad Peacock will be Houston's No. 5 starter to open the season. ... 1B AJ Reed was optioned to the minors.